The tiki bar style pictured below can be designed and crafted for you in the size and colors of your choice. 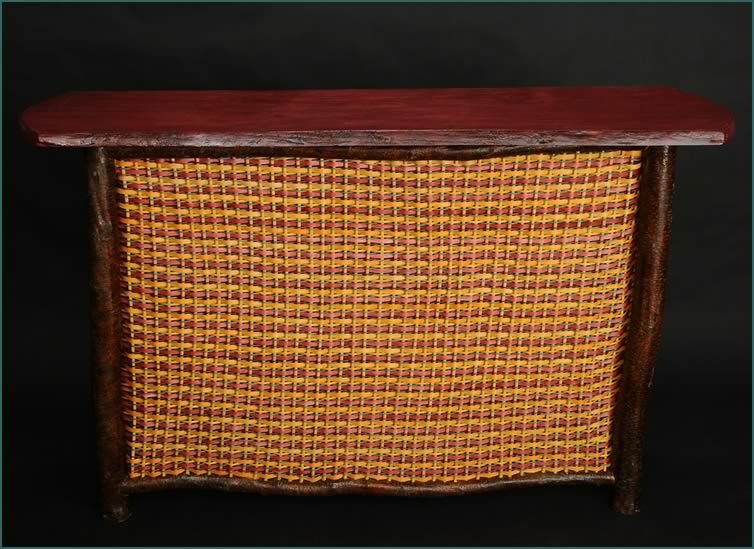 Tina welcomes commissions to custom build and custom weave tiki bars, and other furniture. Contact Tina directly to commission a custom-designed tiki bar. H 38" W 60" D 17"
Tina has built the frame of this tiki bar from alder trees and woven its face and sides from reeds she has dyed in the colors of wine, yellow, teal, purple, and light green. She crafted the top of this unique and colorful piece of furniture from white pine with a "live-edge" stained to complement the colors of the alder frame and colorful weave. She has built a practical shelf into the bar's inside. See another view of Wine Down. View an enlargement of Wine Down's construction detail. View more construction detail of this tiki bar.